Approximate Room Size: 400 sq. ft. The guest rooms are available with a king, queen, or two queen beds. They are also equipped with a desk area and a mini fridge. 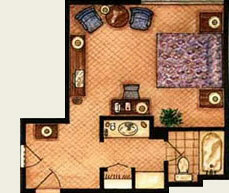 *Amenities are the same in all rooms, lay-out might vary slightly from the pictures shown below. To see all of our Victoria Hotel Photos please visit our Photo Gallery page.